Daniel Jordan is the concertmaster of the Sarasota Orchestra and the Assistant Principal 2nd violinist of the Santa Fe Opera orchestra. He was formerly the Assistant Principal 1st violinist of the Malaysian Philharmonic Orchestra in Kuala Lumpur, and a member of the New World Symphony in Miami Beach. 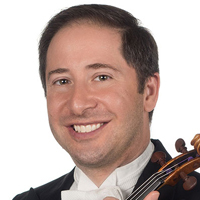 He has played as concertmaster of the Waterbury (Connecticut) Symphony, Spoleto (Charleston) Festival, and Erie Philharmonic, and served in the sections of the St. Louis Symphony, Naples Philharmonic, and Florida Orchestra. Previous to his tenure in Santa Fe, summers have been spent as a member of the Sun Valley (Idaho) Summer Symphony, Assistant Concertmaster of the Colorado Music Festival, and Concertmaster of the National Repertory Orchestra. He has also twice returned to lead the New World Symphony as concertmaster in alumni concerts. Recent summer credits include performances with the Sarasota Music Festival and Santa Fe Chamber Music Festival. Daniel received his Bachelor’s and Master’s degrees from the Cleveland Institute of Music as a student of Donald Weilerstein and David Updegraff. Prior to that he was a student at the Harid Conservatory and Interlochen Arts Academy. The violin he plays on is the ex Humphreys 1695 Peter Guarneri of Mantua and the bow he uses is a Dominique Peccatte, both generously on loan to the Sarasota Orchestra from the Steinwachs Family Foundation. He is married to another violinist in the Sarasota Orchestra, Chung-Yon Hong, and is the proud father of a three year old son, Spencer.